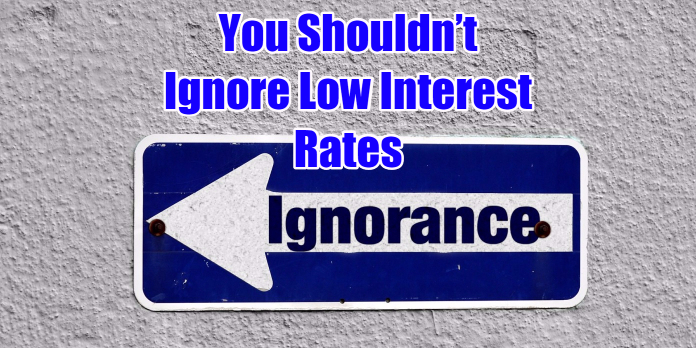 You Shouldn’t Ignore Low Interest Rates: Why? If you haven’t noticed or have been living under a rock, interest rates are still at or near historically low numbers and this article is going to go over why You Shouldn’t Ignore Low Interest Rates. The key concept here is Don’t Ignore Low Interest Rates and the main reason why you shouldn’t ignore this is the fact that the volume of loans always increases when rates are low. For example, in 2016 as compared to a year prior, mortgage refinances have increased in volume by more than 20% while home purchases have increased by over 10% in the same timeframe. It is no secret that rates can’t stay this low forever, and it is up to you to make the right decisions before you miss out on this and cost yourself a lot of money. Knowing that You Shouldn’t Ignore Low Interest Rates is key especially when knowing how volatile mortgage rates are and how they fluctuate multiple times per day. Just because you get pricing in the morning, doesn’t mean by the afternoon or the next day that same rate is available if you haven’t locked in. If you see an interest rate that intrigues you, the best advice is to get a lock done on that rate so you don’t miss out and find yourself stuck with a higher interest rate. If we put this example into the true amount you lost, let’s say you were looking at a $200,000 mortgage at 3.50% and if by the time you lock, the interest rate is 3.625% the difference is $14, $168 annually, or $5,040 over the course of the loan. So just by your rate increasing very little, it can wind up costing you thousands and this is why You Shouldn’t Ignore Low Interest Rates. Let’s take a look at another example of why You Shouldn’t Ignore Low Interest Rates and fall into procrastination. If we take that same $200,000 mortgage at 4.5% you would have a monthly payment of $1,013, now for every month you don’t refinance at 3.5% you would be missing out on $115 each month as your new payment should be $898. If there is money on the table and all you have to do is refinance, it is silly not to, and this is why You Shouldn’t Ignore Low Interest Rates. What good does giving away over $100 per month do for you? There is so much more you can do with those added funds in your budget such as investing or saving it for a needed vacation. In the grand scheme of things when knowing You Shouldn’t Ignore Low Interest Rates, you need to have a plan for when the market supports an interest rate you are comfortable refinancing to. It is ultimately your call and don’t feel pressured by a loan officer. This is a major decision and should only be completed with 100% confidence in what you are doing. If you are looking for a care-free refinancing or purchase transaction, then you need to give me a call ASAP so we can get your file started. Always remember, I am working for you and will only do what is in your best interest and only with your discretion at ALL times! Feel free to call me at 888-900-1020 or visit my website for more details and information www.loanconsultants.org.